Each year I try new things in the greenhouse and not just new orchids. This year it was an old product I thought had been discontinued, CRC formula 6-56 Marine (in the aquamarine spray can). Last spring when heaters were turned off, I sprayed all electrical connections on the heaters and thermostats with this product. We used to use CRC 6-56 on everything electrical on outboard motors. CRC Marine did just what I had hoped. Heaters and thermostats worked just as if they had just been turned off at the end of last year’s cold season. Given the heat and humidity in the greenhouse all summer, that is a major accomplishment. Usually, the first cold snap of the year is brief and allows us to check our systems whether that is a greenhouse heating system, a cart that goes into the garage when nights are cold or clearing a table next to a window for orchids that had been residing outside. 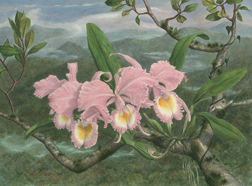 Orchids adapt over time to whatever conditions that had been their environment for the past several months. Now, your orchids must adjust to a different growing area and the conditions that go with it. A closed greenhouse dried by heaters or a house where heaters are running requires an adjustment by you as the grower, and by your orchids. Be prepared to lose flower buds on phals or Dendrobiums caused by the change of environment. Don’t despair if that happens. If you can create some semblance of an appropriate environment, your orchids will survive. Maintain an appropriate temperature and humidity and your orchids will at least survive, although they may not thrive until it is warm enough to move them back outside in spring. For my greenhouse this year rots have been unusually tenacious and difficult to stop, despite using stronger products than normally used. Years ago, I visited a greenhouse that had lost power for several days after a hurricane and was told that bacterial rots were everywhere by the time power was restored and fans were once again running. The combination of excess heat and 100% humidity is the perfect storm when it comes to bacteria. Everywhere I looked, there were signs of rot, but also a light blue stain on leaves, benches, and walls. I was told that the product of last resort was Kocide, a copper-based product. There are other copper based products as well, such as Phyton 27. This year, it became my product of “last resort”, too and it worked as advertised. Anyone that reaches this point must be aware that this is a toxic chemical and carefully read the label before using it. Besides the obvious respirator, care must be taken to avoid contact with the skin as copper in this form is toxic. Ornamental plants with thin soft leaves may be harmed or killed and orchids damaged as well if they have new or soft leaves. The best solution to rots is to prevent them. The problem for me this year was not just the perfect conditions for rot, but the fact that my orchids were crowded; one consequence of a great growing year. Managing an orchid collection is much more than just finding and buying orchids, but determining what you love best. Many years ago I remember being so impressed by a hobbyist that provided orchids for the local society exhibit and every orchid was more spectacular than the last and all extremely well grown. Most were miltonia hybrids and all in large baskets. I asked him what other types of orchids he grew and he said that this was all of them. There are not many of us that can say every single orchid we grow is grown to perfection. Obviously, he managed his collection far better than I.